“Good evening my dear children. I will not be coming very often now, but my presence is always here. I will never leave you. The Blessed Mother was holding the rosary and She was praying with us. “Thank you for your invitation. Holy angels and saints are praying with you. I am the Mother of the Holy Rosary. My children, this is the hour of Justice and Mercy. This is the hour of Chastisement and Salvation. And this is the hour of Prayers. (Holding up the rosary.) This is a powerful weapon to fight the evil force of darkness. The Rosary is a simple and powerful prayer. It is your weapon because you are praying to the Divine Trinity. You are children of mine and continue to pray, because you need more prayers. “I am your Mother who brings help and salvation and peace to al mankind. I am gathering my children to walk with me along the road to humility, simplicity and littleness. “I am your Mother of Comfort. 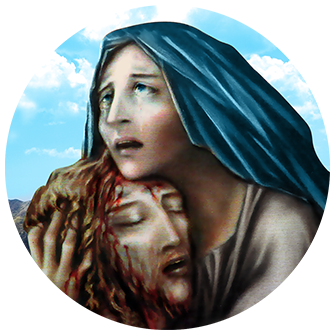 Offer all your trials and sufferings to my Immaculate Heart and in return. I will shower you with more graces that flow from my heart. Kingston, Ontario / October 8, 1997 / Wednesday, 9:00 p.m.